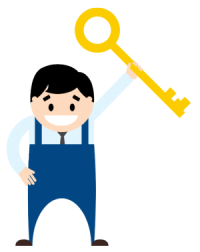 Did you know that locksmiths were used hundreds of years ago? A Locksmith was a very honorable and important skill that not very many people had. There’s so many cool and interesting facts about locks and locksmiths that a lot of people don’t know! Here we share with you some pretty awesome locksmith facts. King Louis the XVI was a Locksmith who acquired his skills out of pure interest and often duplicated keys for fun. The ancient Egyptians made the first recorded wooden lock, the oldest lock in history is over 4,000 years old. In mythology, keys and locks have always had a certain mystique. Holding keys represents power, authority and security. The gods themselves, along with goddesses and saints, are believed to hold the keys to the Kingdom of Heaven. Magician Harry Houdini was trained as a Locksmith at age 11 and practiced escaping from countless real locks. Mr. Samuel Segal (a former New York City policeman) invented the first jimmy proof locks in 1916. Segal holds over twenty-five patents. One of the basic lock designs is the lever. A small lever made of metal works with a bolt, and this design dates back to the Roman Empire. Locksmiths can duplicate almost any key! There is a lock picking championship, called the Dutch Open (organized by TOOOL) that began in 2002 and hosts competitors from around the globe. Pad locks were very popular among merchants and travelers and were often intricately and beautifully decorated. Early metal locks were artistic with remarkable geometric shapes and symbolic representations of animals and religious images. Locksmiths are very educated! They combine the trades of a carpenter, mechanic, machinist, and security expert. Traditionally, a locksmith did not only help to open and install your locks, but built them by hand, including customized designs. Keys can be double sided or four sided, for extra security depending what you prefer. Romans used to wear keys as rings as symbols of wealth, and for security. Fun Locksmith Facts https://24hourslocksmiths.com/fun-locksmith-facts/ 4.3/5 based upon 23 reviews.